Where can I learn more about motivational interviewing? You can go to the website hosted by Motivational Interviewing Network of Trainers (MINT), an international non-profit organization committed to promoting high-quality MI practice and training. You might find some of our case studies, research, and publications to be of interest as they all highlight the application of MI to the healthcare setting; these can be found on our website here. Another great resource is the third edition of the book, “Motivational Interviewing: Helping People Change” by William Miller and Stephen Rollnick (the founders of Motivational Interviewing.) This can be found at amazon.com or on Guildford Press’s website. If you want to do a search for research specific to your setting and population, go the PubMed site and refine your search. I think our staff are already using motivational interviewing as they had a training in it, but we’d still like to improve our patient engagement and treatment adherence. Can you help? Kudus to your team for your commitment to this evidence-based health coaching approach! If you haven’t already done so, it can very helpful to get an overall assessment of your team’s strengths and areas for improvement. We know that beginning levels of proficiency MI enhance patient engagement; however, clinical outcomes and treatment adherence are correlated with full proficiency. 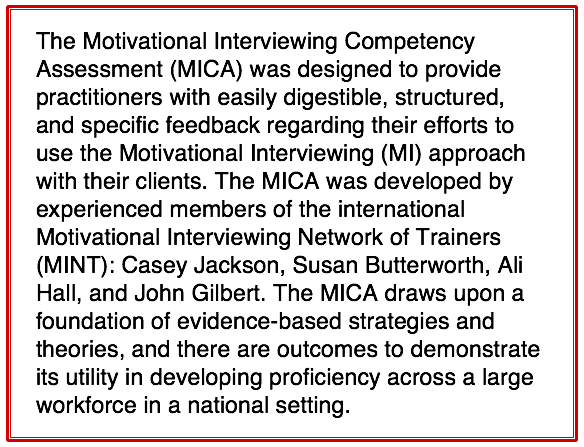 We use the Motivational Interviewing Competency Assessment (MICA) coding system to assess patient sessions, and each clinician receives a feedback report. We also provide an aggregate or summary report about your team, along with an overview of current strengths and recommendations for training activities. Our staff were certified using a different health coaching approach. How is motivational interviewing different? 1. Evidence Base. There are many other health coaching approaches and some are effective. Unfortunately, we don’t have the standardization or the research to fully measure them. In multiple reviews of literature, MI has been identified as the only health coaching approach that is standardized, has validated tools to assess fidelity, and is linked to numerous rigorous clinical trials that demonstrate its efficacy. At current time, there are over 900 clinical trials that have been completed or are in process. 2. Emphasis on Change Talk. The emphasis on the language of change talk also separates MI from other health coaching approaches. Some of the most exciting research in the last several years has been in this area. It takes an advanced skill-set to learn how to evoke and respond to change talk. This is one way to vet a potential MI trainer – if they don’t include instruction on what is called DARN and CAT change talk, they are not using the most up-to-date and critical material. On your site, you mention a guarantee that your team can improve our patient satisfaction scores. Are you prepared to go at risk in your contract? Absolutely! We set mutually agreed-upon goals and provisions with you and will return a percentage of the fees if we don’t meet them. Dr. Butterworth has a track record for building this type of accountability into her contracts during her tenure at OHSU and her health coaching team never missed their mark. Our leadership frowns on using external consultants or services for extended periods of time. What is your position on helping us build our own internal training and QA team for this type of health coaching? This type of partnership is a cornerstone of Q-consult’s core business practices. We would love to discuss the type of sustainability plan, along with initial training, that allows you to build your internal resources so that we can “hand the baton off” to your team. This plan includes the development of an internal mentor program, assessment/coding training for QA purposes, and the training of internal instructors for new hire training.